According to the American Hospital Association, America has 4,840 general hospitals that aren’t run by the federal government: 2,849 are nonprofit, 1,035 are for-profit and 956 are owned by state or local governments. What is the distinction between a for-profit and not-for-profit hospital… besides the obvious? The obvious difference is that one is “for-profit” and one is “not-for-profit” – but any reader of the English language would be able to tell you that. Unknown to some is that the not-for-profit status does not mean that the hospital will not make money; the status has nothing to do with a hospitals bottom line. Just ask any charity that brings in millions of dollars. The most significant variation between non-profit and for-profit hospitals is tax status. Not-for-profit hospitals are exempt from state and local taxes. Some say that for-profit hospitals have to be more cost-effective because they have sales taxes and property taxes. I can understand that sentiment. Sales taxes and property taxes are nothing to sneeze at. The organizational structure and culture also varies at for-profit hospitals rather than not-for-profit hospitals. For-profit hospitals have to answer to shareholders and/or investors. Those that are publicly traded may have a high attrition rate at the top executive level because when poor performance occurs heads tend to roll. Bargaining power is another big difference between for-profit and non-profit. For-profit has it while non-profit, generally, do not. The imbalance of bargaining power comes into play when the government negotiates its managed care contracts. I also believe that bargaining power is a strong catalyst in the push for mergers. Being a minnow means that you have insect larvae and fish eggs to consume. Being a whale, however, allows you to feed on sea lion, squid, and other larger fish. A report conducted by the Health Research Institute showed 255 healthcare merger and acquisition (M&A) deals in the second quarter of 2018. Just the second quarter! According to the report, deal volume is up 9.4% since last year. The most active sub-sector in the second quarter of 2018 is long-term care, with 104 announced healthcare M&A deals representing almost 41% of deal volume. The trend today is that for-profit hospitals are buying up smaller, for-profit hospitals and, any and all, not-for-profit hospitals. The upshot is that hospitals are growing larger, more massive, more “corporate-like,” and less community-based. Is this trend positive or negative? I will have to research whether the prices of services increase at hospitals that are for-profit rather than not-for-profit, but I have a gut feeling that they do. Not that prices are the only variable to determine whether the merger trend is positive or negative. From the hospital’s perspective, I would much rather be the whale, not the minnow. I would feel much more comfortable swimming around. My opinion is that, as our health care system veers toward value-based reimbursement and this metamorphous places financial pressure on providers, health care providers are struggling for more efficient means of cost control. The logical solution is to merge and buy up the smaller fish until your entity is a whale. Whales have more bargaining power and more budget. In 2017, 29 for-profit companies bought 18 for-profit hospitals and 11 not-for-profits, according to an analysis for Kaiser Health News. 10 hospital M&A transactions involved health care organizations with net revenues of $1 billion or more in 2017. Here, in NC, Mission Health, a former, not-for-profit hospital in Asheville, announced in March 2018 that HCA Healthcare, the largest, for-profit, hospital chain would buy it for $1.5 billion. The NC Attorney General had to sign off on the deal since the deal involved a non-profit turning for-profit, and he did ultimately did sign off on it. Regardless your opinion on the matter, merger mania has manifested. Providers need to determine whether they want to be a whale or a minnow. Medicaid Incidents: To Report or Not To Report? The answer resides in the injury, not the quality of the care. A consumer trips and falls at your long term care facility. It is during her personal care services (PCS). Dorothy, a longtime LPN and one of your most trusted employees, is on duty. According to Dorothy, she was aiding Ms. Brown (the consumer who fell) from the restroom when Ms. Brown sneezed multiple times resulting in a need for a tissue. Dorothy goes to the restroom (only a few feet away) when Ms. Brown’s fourth sneeze sends her reeling backward and falling on her hip. To report or not to report? That is the question. Is Ms. Brown’s fall a Level I, Level II, or a Level III incident? What are your reporting duties? If you answered Level II and no requirement to report – you would be correct. If you answered Level III and that you must report the incident within 24 hours, you would be correct. Wait, what? How could both answers be correct? Which is it? A Level II and no reporting it or a Level III and a report due within 24 hours? It depends on Ms. Brown’s injuries, which is what I find fascinating and a little… how should I put it… wrong?! Think about it…the level of incident and the reporting requirement is not based on whether Dorothy properly provided services to Ms.Brown. No…the answer resides in Ms. Brown’s injuries. Whether Dorothy acted appropriately or not appropriately or rendered sub-par services has no bearing on the level of incident or reporting standards. According to the Department of Health and Human Services’ (DHHS) Incident Response and Reporting Manual, Ms. Brown’s fall would fall (no pun intended) within a Level II of response if Ms. Brown’s injuries were not a permanent or psychological impairment. She bruised her hip, but there was no major injury. However, if Ms. Brown’s fall led to a broken hip, surgery, and a replacement of her hip, then her fall would fall within a Level III response that needs to be reported within 24 hours. Furthermore, even at a Level III response, no reporting would be required except that, in my hypothetical, the fall occurred while Dorothy was rendering PCS, which is a billable Medicaid service. Assuming that Ms. Brown is on Medicaid and Medicare (and qualifies for PCS), Dorothy’s employer can be reimbursed for PCS; therefore, the reporting requirement within 24 hours is activated. In each scenario, Dorothy’s actions remain the same. It is the extent of Ms. Brown’s injury that changes. These tables are not exhaustive, so please click on the link above to review the entire Incident Response and Reporting Manual. Use the federal Occupational Safety and Health Administration’s (OSHA) guidelines to distinguish between injuries requiring first aid and those requiring treatment by a health professional. A visit to an emergency room (in and of itself) is not considered an incident. pursuant to G.S. 108A Article 6, G.S. 7B Article 3 and 10A NCAC 27G .0610. Providing residential services to anyone is, inevitably, more highly regulated than providing outpatient services. The chance of injury, no matter the cause, is exponentially greater if the consumer is in your care 24-hours a day. That’s life. But if you do provide residential services, know your reporting mandates or you could suffer penalties, fines, and possible closure. In cases of reporting guidelines, it is prudent to keep your attorney on speed dial. There are more than 15,000 nursing homes across the country. Even as the elderly population balloons, more and more nursing homes are closing. The main reason is that Medicare covers little at a nursing home, but Medicare does cover at-home and community-based services; i.e., personal care services at your house. Medicare covers nothing for long term care if the recipient only needs custodial care. If the recipient requires a skilled nursing facility (SNF), Medicare will cover the first 100 days, although a co-pay kicks in on day 21. Plus, Medicare only covers the first 100 days if the recipient meets the 3-day inpatient hospital stay requirement for a covered SNF stay. For these monetary reasons, Individuals are trying to stay in their own homes more than in the past, which negatively impacts nursing homes. Apparently, the long term care facilities need to lobby for changes in Medicare. Closing a SNF, especially if it is Medicare certified, can be tricky to maneuver the stringent regulations. You cannot just be dismissive and say, “Bye, Felicia,” and walk away. Closing a SNF can be as legally esoteric as opening a SNF. It is imperative that you close a SNF in accordance with all applicable federal regulations; otherwise you could face some “sniff” fines. Bye, Felicia! Section 6113 of the Affordable Care Act dictates the requirements for closing SNFs. SNF closures can be voluntary or involuntary. So-called involuntary closures occur when health officials rule that homes have provided inadequate care, and Medicaid and Medicare cut off reimbursements. There were 106 terminations of nursing home contracts in 2014, according to the federal Centers for Medicare and Medicaid Services (CMS). Regardless, according to law, the SNF must provide notice of the impending closure to the State and consumers (or legal representatives) at least 60 days before closure. An exception is if the SNF is shut down by the state or federal government, then the notice is required whenever the Secretary deems appropriate. Notice also must be provided to the State Medicaid agency, the patient’s primary care doctors, the SNF’s medical director, and the CMS regional office. Once notice is provided, the SNF may not admit new patients. Considering the patients who reside within a SNF, by definition, need skilled care, the SNF also has to plan and organize the relocation of its patients. These relocation plans must be approved by the State. Further, if the SNF violates these regulations the administrator of the facility and will be subject to civil monetary penalty (CMP) as follows: A minimum of $500 for the first offense; a minimum of $1,500 for the second offense; and a minimum of $3,000 for the third and subsequent offenses. Plus, the administrator could be subject to higher amounts of CMPs (not to exceed ($100,000) based on criteria that CMS will identify in interpretative guidelines. CMS Proposes Mandatory Bundled Medicare Reimbursements: Financial Risk on Hospitals! A new CMS proposal could transform durable medical equipment (DME) Medicare reimbursements to hospitals. The proposal, if adopted, would implement a mandatory bundled Medicare reimbursement for hip and knee replacements or lower extremity joint replacements (LEJRs). CMS has proposed this change to be piloted in 75 metropolitan areas prior to being implemented nationwide. This mandatory bundled Medicare reimbursement will be unprecedented, as, thus far, CMS has only implemented voluntary bundled reimbursement rates. However, CMS has stated that its goal is to have at least 50% of all Medicare fee-for-service reimbursement to be paid under an alternative payment model by 2018, and, in order to meet this objective, CMS will need to implement more mandatory alternative payment models. Another first is that CMS proposes that hospitals bear the brunt of the financial risk. To date, CMS has not targeted a type of health care provider as being a Guinea pig for new ideas, unlike the other proposed and implemented Bundled Payments for Care Improvement (BPCI) initiative where there are many types of providers that can participate and bear risks. Will this affect NC hospitals? Of the 75 metropolitan areas chosen as “test sites” for the new bundled payment plan, 3 are located in NC. Apparently, CMS believes that Durham and Chapel Hill are one city, but you got to give it to them…by hyphenating Durham and Chapel Hill, CMS gets both Duke and UNC health systems to participate in the mandatory trial. Other large metro areas included in the trial are Los Angeles, New York City, and Miami. LEJRs are the most frequent surgeries in the Medicare population. The average Medicare expenditures for LEJRs, including surgery, hospitalization, and recovery, can range from $16,500 to $33,000. The mandatory bundled reimbursement will become effective January 2, 2016; however, the hospitals will not carry the financial risk until January 1, 2017. So, hospitals, you got a year and a half to figure it out!! What exactly will this bundled reimbursement rate include? Answer: Everything from an inpatient admission billed under MS DRG 469 or 470 until 90 days following discharge. And we are talking about everything. What should you do if you are a hospital so graciously selected to participate? 1. Assess your protocol as to discharging patients. Where do your patients go after being discharged? 2. Determine whether you want to partner with any critical care facilities, skilled nursing agencies, or home health agencies. 3. Assess your current reimbursement rates and analyze what current delivery patterns must be revamped in order to maintain profitability. 4. Determine future care management and clinical reprogram needs. 5. Analyze ways to provide more efficient delivery components. 6. Communicate with your DME vendors. Discuss ways to decrease spending and increase efficiency. 7. Plan all ways in which you will follow the patient after discharge through the 90 day period. If you would like to comment on the proposed rule, you have until September 8, 2015 at 5:00pm. As I was preparing my Power Point for speaking at the NC Association of Long Term Care Facilities (NCALTCF), I ran across a number of interesting issues on which I could blog. If you are attending the annual NCALTCF conference September 8-10, this will be a prelude to a portion of my presentation. I will be speaking on September 8th. I am reviewing the history of personal care services (PCS) rates, and I realize that a few years ago, the parity of PCS rates for home health care providers and long-term care facilities (LTCF) occurred. The issue? Why the parity? I am curious. I remember vividly the parity change in 2012. But, I wonder, why did it occur? 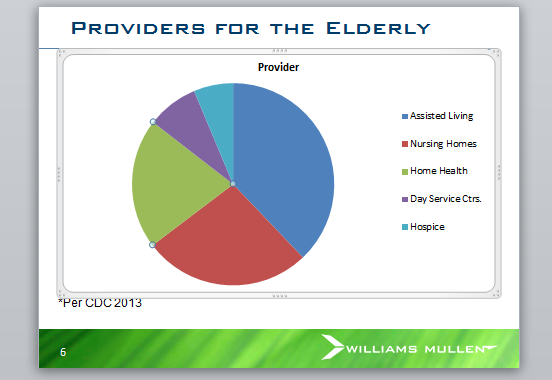 Home health care companies provide PCS to people within their own homes (obviously a much-needed and growing service). Long term care facilities (LTCF) provide PCS within a facility. But LTCFs have higher overhead due to mortgage/rent, 24-hour staff, monthly bills, more regulatory compliance issues, a cafeteria or kitchen, etc. Whereas, a home health care company does not incur these expenses. Why NOT pay LTCF a higher PCS reimbursement rate? The answer is…we did, in North Carolina. And the federal government found that we violated the Americans with Disabilities Act (ADA). Here is the percentage breakdown of people receiving home health, assisted living, nursing homes, hospice, and day service centers, on a national basis in 2013, according to the Centers for Disease Control (CDC). Notice the green, home health section. Home health has grown at a very rapid rate since 2000. But assisted living (blue) is still predominant. Back before 2010 and in an attempt to help adult care homes that provide assistance with dementia patients, the General Assembly provided an enhanced Medicaid rate for those facilities. In 2010, Disability Rights filed a complaint with the federal government complaining about NC’s disparate PCS rates between LTCF and home health. In 2011, the US Department of Justice investigated and agreed with Disability Rights. NC was violating Olmstead by providing two different reimbursement rates. The General Assembly (GA) tackled the issue in 2012. The GA decreased the LTCF’s enhanced PCS rate to the home health’s rate in order to comply with federal law. Although there was a limit as to the number of hours of PCS per month, the GA wrote in an extra 50 hours per month for people suffering from dementia. Disability Rights originally made the 2010 complaint to the federal government with honest, well-meaning intentions. Disability Rights wanted better care for the mentally ill. And Olmstead had wonderful results for the mentally ill. Now people suffering from mental illness can remain in their homes, if desired (although sometimes a legal battle is required). But the unknown, unintentional consequence of Olmstead for the owners of LTCFs is that the PCS rate became paired with the home health PCS rate, which keeps declining. For example, prior to October 1, 2013, the PCS rate was $15.52 (now it is $13.88). The federal minimal wage is $7.25. People who are paid minimum wage, generally, are not licensed professionals. Most members of a LTCF staff are licensed. Many are certified nurse assistants (CNAs). Most are required to attend yearly continuing education classes. Should these CNAs and licensed professionals make only $6.00 more than minimum wage? Are not professional licensees worth more? Not to mention…let’s talk about what LTCF staff actually does on a day-to-day basis. My Grandma Carson resides in a LTCF. Thankfully, she still lives in her own independent living house on the LTCF grounds because she can maintain her independent living, but many residents of LTCF cannot. LTCF staff assists in activities of daily living (ADLs), such as toileting, eating, ambulating, and grooming. When my great-grandmother could no longer feed herself, the wonderful staff at Glenaire in Cary, NC fed her. Should a person feeding an elderly person (and bathing and helping go to the bathroom) NOT be paid well-over minimum wage? Well…the reimbursement rate may be $13.88 (a tad over $6.00 above minimum wage), but a PCS worker for a home health agency AND a LTCF does not earn $13.88/hour, they earn less. Companies are created to earn a profit. There is nothing wrong with earning a profit. In fact, starting January 1, 2014, PCS workers in home health are now eligible for minimum wage. “ARE NOW ELIGIBLE.” As in, last year, PCS workers could have earned LESS than minimal wage. In the future, I hope that health care providers who provide PCS services are paid more; I also hope that, in the future, the PCS rate increases. Someday, I will be the recipient of a PCS worker.